Hello! TGIF! 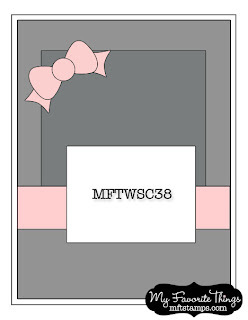 Today I have a card using the latest MFT Wednesday Sketch #38. I made this for Nurse Andrea, the nurse at Sabrina's school. When I saw the sketch, I knew that I wanted to use this sweet Pure Innocence girl. This one is called PI - Best Medicine. I stamped, colored, and cut her out, then I added her over the text background. The text background, and die which I used to frame her is from the Die-namics First Class Friend and stamp set). The "Happy Birthday" sentiment is also from the same set. I added a felt rolled rose using the Die-namics Mini Rolled Roses (larger of the two). Accessories: Die-namics First Class Friend and stamp set, Die-namics Mini Rolled Roses (My Favorite Things); Markers (Copic), Ribbon, Twine (May Arts), Felt, Shiny silver pearls (Pizzazz Aplenty), Foam tape, Thread, Sewing machine. This is absolutely beautiful! I love the rich colors and the bow/rose combo. 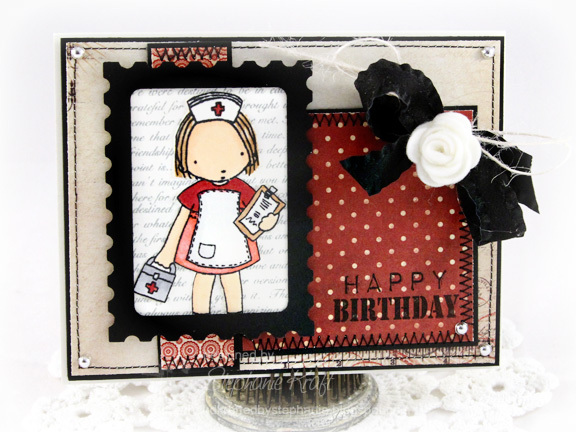 I have a sil who's a nurse and I'm always trying to collect cute nurse images for the cards I make her, so I'll have to add this image to my wishlist - it's darling! Oh my... this is too cute... what an adorable nurse! Beautiful card! very cute, funny, I used the same image with this sketch...but yours definitely blows mine away ;-) Fabulous job!